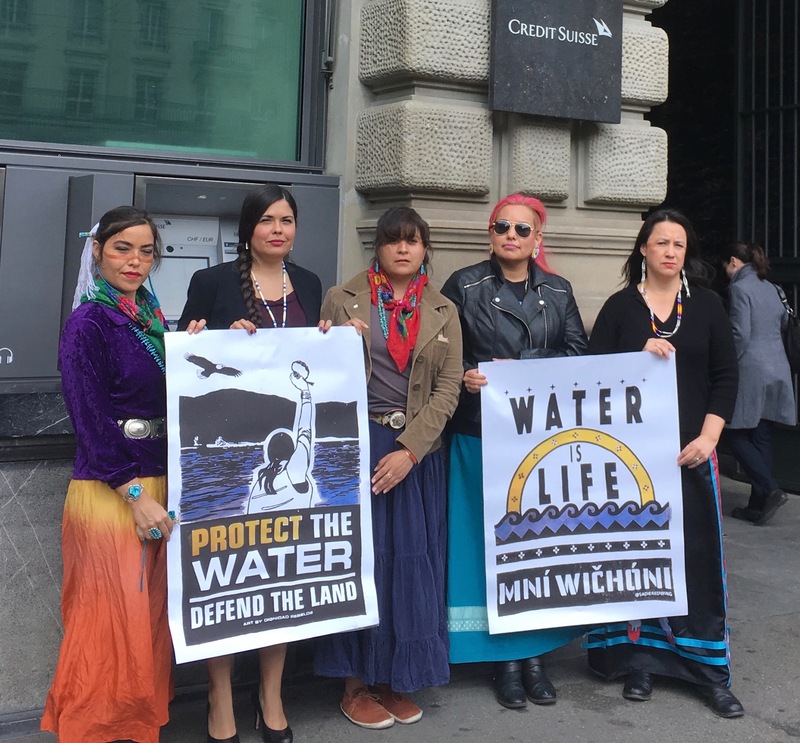 ZURICH, SWITZERLAND (April 7, 2017) – Over the last week, a delegation of Indigenous women from Standing Rock and their allies who observed and/or experienced human rights and Indigenous rights violations in North Dakota due to the building of the Dakota Access pipeline have been taking action and speaking out in Switzerland, sharing on-the-ground experiences from Standing Rock and other traditional territories, as Indigenous women who are living in communities directly impacted by fossil fuel development and infrastructure. After a successful previous week in Norway including meetings with the Oil Fund, DNB, the Norwegian Parliament, and Sami Indigenous peoples of the region, the ‘Indigenous Women’s Divestment Delegation: Experiences from Standing Rock’ received a request to travel to Switzerland to continue their work to highlight Indigenous and human rights violations and demand pipeline divestment. Like Norway, some the largest funders and supporters of the Dakota Access pipeline and other fossil fuel developments in the U.S. and across the world are based in Switzerland. In Zurich, the Delegation met with Credit Suisse and UBS, and held a press conference, public event and interview sessions with leading media outlets. The Indigenous Women’s Divestment Delegation was organized with the support of the Women’s Earth and Climate Action Network (WECAN) International in response to the leadership and request of frontline Indigenous women seeking financial divestment from DAPL and other fossil fuel developments, which threaten the lives, rights and cultural survival of their nations and peoples. This entry was posted in Visionary Leadership by lrinspire. Bookmark the permalink.